Sun, Jun 4, 2017, 05:26 am SL Time, ColomboPage News Desk, Sri Lanka. June 04, Colombo: U.S. 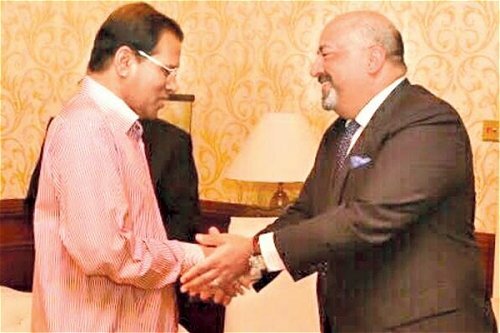 Ambassador to Sri Lanka Atul Keshap joined President Maithripala Sirisena to announce approximately Rs. 350 million ($2.3 million) in humanitarian assistance from the United States government and people to help victims of flooding and landslides in Sri Lanka. The aid will be used to provide safe drinking water, hygiene kits, emergency shelter materials, home repair kits and critical health care services to stave off diseases. A portion of the assistance will be provided through Sarvodaya, a Sri Lankan non-governmental and charitable organization. "Americans and Sri Lankans have shared a deep bond throughout the history of our two countries," said Ambassador Keshap. "The people of both countries have always stood side-by-side in times of need." The assistance will be provided through the U.S. Office of Foreign Disaster Assistance (OFDA), part of the United States Agency for International Development (USAID). Since 2001, OFDA has provided approximately LKR 19 billion ($125 million) in disaster assistance and disaster risk reduction to Sri Lanka. In addition to the relief supplies, disaster experts from USAID/OFDA and the Department of Defense�s Civil Military Support Element (CMSE) attached to the U.S Embassy are helping organize U.S. response efforts, conducting damage assessments, and working with Sri Lankan government officials and humanitarian partners to evaluate needs on the ground. U.S. Army engineers and Reserve Officer Training Corps (ROTC) cadets are cleaning and repairing flood damage at schools in the Kalutara district in coordination with CMSE, the Disaster Management Centre, and local officials. Families of the U.S. Embassy community have also provided personal donations to Sri Lanka Unites, a youth-led organization. The United States also continues to support long-term projects to reduce the risks of future disasters. USAID has provided disaster-resilient water systems to ensure safe drinking water, developed flash flood warning systems, and worked with government and local communities to strengthen disaster response and management capacity. In addition, since 2011 the U.S. Embassy has provided over LKR 2.3 billion ($15 million) to construct new facilities in schools and health care centers that serve as temporary shelter for those displaced by natural disasters. The U.S. Embassy is monitoring the situation and continues to work closely with Sri Lankan government disaster relief authorities to identify further needs.